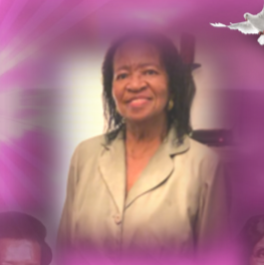 Mrs. Barbara Nell Fielder Rivers, of Dadeville died Wednesday, March 27, 2019, at Columbus Hospice House, Columbus, GA.  Funeral  services will be held at New Adka Missionary Baptist Church, Dadeville on Thursday,  April 4, 2019 at  1:00 p.m. (CST) with Rev. Edward Milner officiating. Interment will be in the Shiloh Cemetery, Camp Hill. The remains will lie in state at the church from 12:00 p.m. (CST) until the funeral hour. Mrs. Rivers is survived by her six children: Charmette Rivers (Lee) Leonard, Vernetta Nicole Rivers, Arthur James (Helena) Rivers, Bobby Clyde (Lyshell) Rivers, Goodmon (Natosha) Rivers and Jamorris Barchaver (Carleton) Rivers,; a brother: Rev. Clyde Fielder, a niece, Bridget Fielder Jones, twelve grandchildren and a host of other relatives and friends. Prayers of comfort for the family. Mrs. Barbara was an inspiration to me. All our talks will be planted in my heart. Rest in Heaven sweet angel. ?? My deepest condolences to the family. Mrs. Bobbie Nell was a sweet lady, I have a lot of respect for her. She will truly be missed. My prayers and thought go's out to the Family my God be with you in your time of bereavement. Praying for the family. Mrs. Rivers was a sweet and kind co-worker. She will be truly missed. I worked with Mrs. Rivers many years ago, she made coming to work fun, she had this amazing personality that made you feel like everything was going to be ok, so sorry to hear ofher passing, prayers for her family, fly high on that mountain my friend! Barbara was a kind and loving personal friend. I will always cherish her memory. I pray that the family will find comfort in knowing that she is now in the presence of the Lord. Prayers for the entire family. So sorry for your loss. Mrs. Rivers was such a kind and sweet person. She will be missed by all.